The rate at which glucose is absorbed from the intestinal tract appears to be an important parameter in controlling the homeostasis of blood glucose, insulin release, obesity, and possibly weight loss. The intense research of the last few years appears to give the concept of glycaemic index and glycaemic load scientific validity (Ludwig, 2003). Current research suggests a role for elevated blood glucose in the development of chronic diseases and obesity. The concept of glycaemic index and glycaemic load is discussed in this article. An alternative way to classify dietary carbohydrates is by their ease of absorption and their effect on the elevation of blood glucose levels. The implications of consuming high glycaemic index foods for chronic disease and obesity have recently been reviewed (Augustin et al., 2002; Jenkins, 2002; Ludwig, 2002). These reviews suggest that the glycaemic index and glycaemic load (defined below) offer a way to examine the relative risks of diets designed to prevent coronary heart disease (CHD) and obesity. The effect that carbohydrate-containing foods have on blood glucose concentration, called the glycaemic response of the food, varies with the time it takes to digest and absorb the carbohydrates in that food. Some foods cause a rapid rise and fall in blood glucose levels, whereas others cause a slower and more extended rise with a lower peak level and a gradual fall. The concept of the glycaemic index of a food was developed to provide a numerical value to represent the effect of the food on blood glucose levels. It provides a quantitative comparison between foods. Glycaemic index is defined as the increase in blood glucose level over the baseline level during a 2-hour period following the consumption of a defined amount of carbohydrate (usually 50 g) compared with the same amount of carbohydrate in a reference food. Earlier studies typically used glucose as the test food. More recently, white bread is being used, and white bread is assigned a score of 100. In practice, the glycaemic index is measured by determining the elevation of blood glucose for 2 hours following ingestion. The area under the curve after plotting the blood glucose level following ingestion of the reference food is divided by the area under the curve for the reference food times 100 (Figure 1). If glucose is used as the reference food, it is arbitrarily assigned a glycaemic index of 100. With glucose as the reference food white bread has a glycaemic index of about 71. The use of white bread as the reference assigns the glycaemic index of white bread of 100. The use of white bread as the standard causes some foods to have a glycaemic index of greater than 100. One criticism of glycaemic index is the variation of glycaemic index for apparently similar foods. One cause could be the difference in the reference food used. This variation may reflect methodological differences as well as differences in the food preparation and the ingredients used in preparing the food. The difference could also reflect real differences in the biological variety of the food. For instance, the glycaemic index for a baked russet potato is 76.5 and for an instant mashed potato is 87.7 (using glucose as the reference food) (Fernandes et al., 2005). Even the temperature of the food can make a difference: A boiled red potato hot has a glycaemic index of 89.4, and the same potato cold has a glycaemic index of 56.2 (Table 1). The elevation in blood glucose level above the baseline following consumption of a high glycaemic-index food or 50 g of glucose in a reference food (glucose or white bread). The glycaemic index of the reference food is by definition equal to 100 (graph a). The elevation of blood glucose levels above the baseline following the intake of 50 g of glucose in a low glycaemic-index food (graph b). The glycaemic index is calculated by dividing the area under the curve for the test food by the area under the curve by the reference times 100. 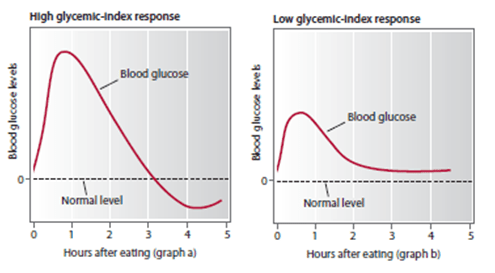 Figure 1: Blood glucose changes following carbohydrate intake (glycaemic index). The question has been raised as to whether the glycaemic index has any practical relevance, because we do not eat a single food but meals that are made up of a number of foods. To address this question, the concept of glycaemic load was introduced. Glycaemic load considers both the quantity and the quality of the carbohydrate in a meal. The glycaemic load (GL) equals the glycaemic index times the grams of carbohydrate in a serving of the food. The higher the GL, the greater the expected elevation in blood glucose and in the insulinogenic effect of the food. Long-term consumption of a diet with a relatively high GL is associated with an increased risk of type-2 diabetes and coronary heart disease (Liu et al., 2000). The literature suggests that the longer and higher the elevation of blood glucose, the greater the risk of developing chronic diseases and obesity (Ludwig, 2002; Augustin et al., 2002). Many published tables provide the glycaemic index for different foods. The most complete is an international table (Foster-Powell et al., 2002). Selected examples from this publication have been reproduced in Table 1 along with the glycaemic index of potatoes. Remember that the food products differ in different regions of the world. The glycaemic indices listed in Table 1 are intended to be used to show trends and not to prepare diets. Glycaemic index and glycaemic load have proven useful in evaluating the risk of developing chronic disease and obesity. One of the risk factors for these chronic diseases appears to be related to the degree of blood glucose elevation and the length of time glucose levels are elevated. Augustin, L.S., Francesch, I.S., Jenkins, D.J., Kendall, C.W. & Lavecchia, C. (2002) Glycemic Index in Chronic Disease: A Review. European Journal of Clinical Nutrition. 56, pp.1049-1071. Fernandes, G., Velangi, A. & Wolever, T.M. (2005) Glycemic Index of Potatoes Commonly Consumed in North America. Journal of the American Dietary Association. 105, pp.557-562. Foster-Powell, K., Holt, S.H. 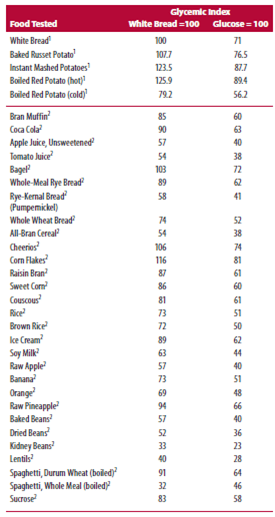 & Brand-Miller, J.C. (2002) International Table of Glycemic Index and Glycemic Load. American Journal of Clinical Nutrition. 76, pp.5-56. Jenkins, D.J. (2002) Glycemic Index: Overview Implications in Health and Disease. American Journal of Clinical Nutrition. 76(Supplement), pp.2665-2735. Liu, S., Willett, W.C., Stampfer, M.J., Hu, F.B., Franz, M., Sampson, L. & Hennekens, C.H. (2000) A Prospective Study of Dietary Glycemic Load, Carbohydrate Intake and Risk of Coronary Heart Disease in US Women. American Journal of Clinical Nutrition. 71, pp.1455-1461. Ludwig, D.S. (2002) The Glycemic Index: Physiological Mechanism Relating to Obesity, Diabetes and Cardiovascular Disease. Journal of the American Medical Association. 287, pp.2414-2424. Ludwig, D.S. (2003) Glycemic Load Comes of Age. Journal of Nutrition. 133, pp.2695-2696.